30paintingsin30days Day 22. 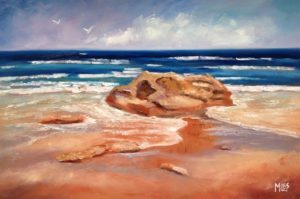 ‘Beach Rock’ I loved the way the waves were swirling around this beach rock and felt inspired to paint this. I was feeling very hot so the painting has a warm orange underpainting which, I think gives it a warm glow. By contrast the sea looks cool and inviting.